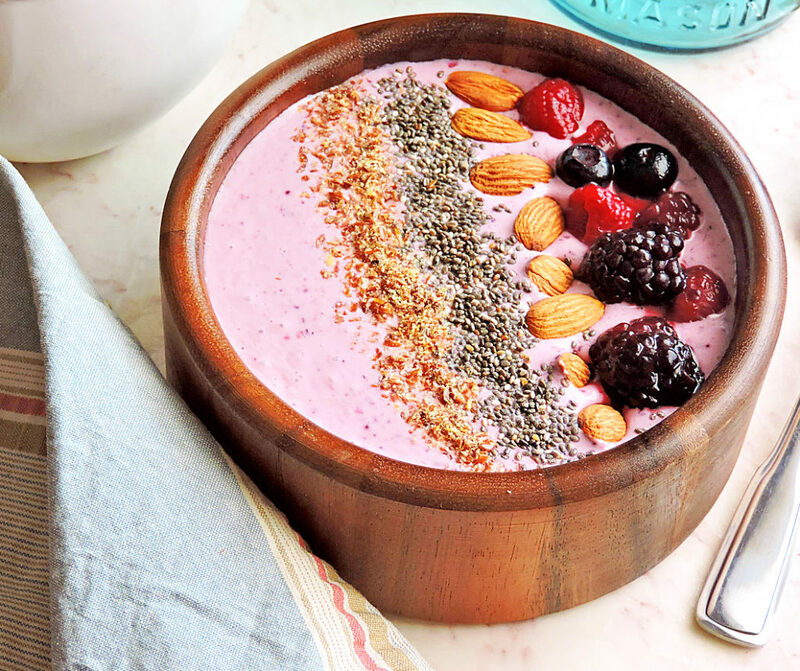 Smoothie Bowls are a quick and easy way to start your day! 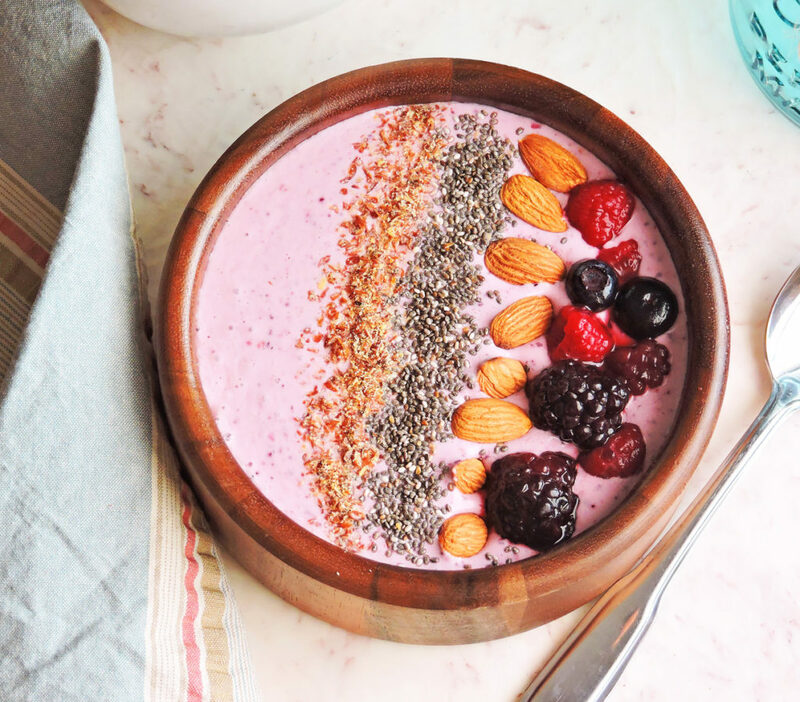 This Oh So Berry Smoothie Bowl will give you the jumpstart you need, and did I mention that it is oh so tasty too! Be sure to check out my secret to the PERFECT smoothie bowl! Ninja Professional Blender with Nutri Ninja Cups . I absolutely can’t live without this blender! I don’t know why, but I was very hesitant to try a smoothie bowl. 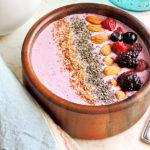 I enjoy smoothies and I often make them for an ‘on-the-go’ breakfast option, but the thought of me eating my smoothie out of a bowl seemed weird to me! My initial thought of a smoothie bowl included a big ol’ bowl of smoothie soup, and who wants to eat smoothie soup?? Lol! Add frozen berries, Greek yogurt, unsweetened almond milk, and vanilla to blender. Blend until smooth. You can top your smoothie with anything you desire, or try my favorite: mixed berries, almonds, chia seeds, and flax seed meal. Smoothie bowls are my favorites. However, yours makes me want to jump through the screen so I can gobble it up. I love that you added, chia and almonds to the recipe. Thank you! This was my very first smoothie bowl and I think I’m hooked! Thanks again! OK – this sounds amazing and looks so beautiful. I will have to try this!! I love smoothie bowls and this recipe looks like one I need to try sooner than later. Thanks for sharing! Thank you! And I hope that you will enjoy it as much as I did! I’m late to the smoothie bowl thing, but I’m intrigued. I’m always looking for new, healthy recipes, and this looks really good. I think I’m going to have to branch out and expand my horizons. 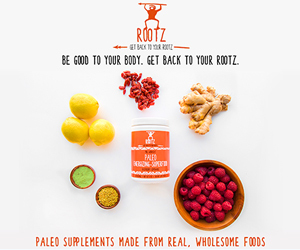 Yes, you’ve got to try it! ? I love that greek yogurt is high in protein, it makes a smoothie bowl so satisfying. This looks great!